Our exhibition is on Tuesday 17th October at our usual venue Brompton Oratory hall when we celebrate the Magic of Autumn. 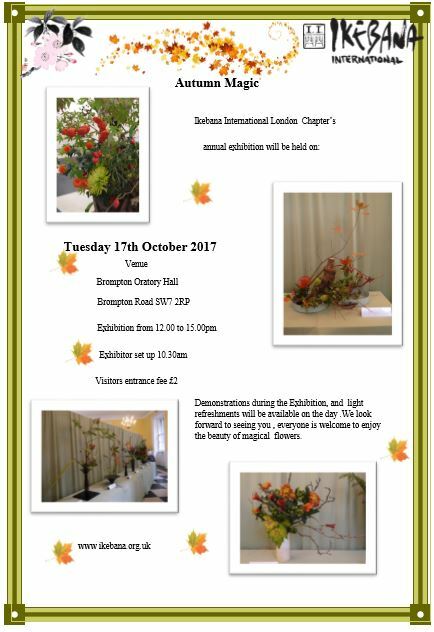 This is a unique chance to see how the different ikebana schools respond to the season via their distinctive arrangements plus the opportunity to talk to members of each of the represented schools. Entry for visitors is from 12pm and the exhibition closes at 15pm. This entry was posted in II London Chapter events programme. Bookmark the permalink.